[138 Pages Report] The food ultrasound market was valued at USD 87.7 Million in 2016. It is projected to reach USD 134.6 Million by 2022, growing at a CAGR of 7.5% from 2017. Ultrasound technology is used for the processing of various food products such as meat & food, fruits & vegetables, beverages, dairy, bakery & confectionery, and others (cereals, grains, pulses, nuts, seeds, spices, and packaged foods). 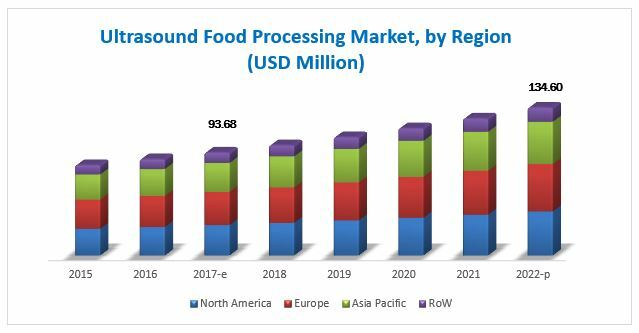 The global market is expected to grow at a considerable rate with the rising awareness about food quality, the demand for an extended shelf-life, and nutritional value in food. Further, the ultrasound technique has been emerging as a new trend in the food industry offering multiple functions such as quality assurance, microbial enzyme) inactivation, homogenization, emulsification, cutting, cleaning, drying, thawing, freezing, and others (drying, mixing, freezing, thawing, crystallization, filtration, pickling, marinating, sterilization, fermentation, pasteurization, and packaging). Market players are responding to new opportunities by expanding their global presence and product offerings. They are witnessing strong demand from the food processing industry due to its high reliability. This report includes estimations of the market size in terms of value (USD million). Both, top-down and bottom-up approaches have been used to estimate and validate the size of the food ultrasound market and to estimate the size of various other dependent submarkets in the overall market. 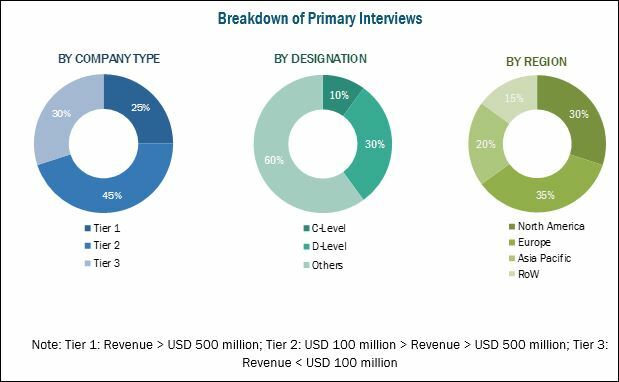 Key players in the market have been identified through secondary research and their market ranking in the respective regions have been determined through primary and secondary research. All percentage shares, splits, and breakdowns have been determined using secondary sources and were verified through primary sources. The key product providers in the food ultrasound market include Bühler, Bosch, Dukane, Hielscher, Emerson, Newtech, Siemens, Cheersonic, Rinco Ultrasonics, Omni International, Sonics & Materials, Elliptical Design, Marchant Schmidt, and Sonomechanics. This research report categorizes the food ultrasound market based on frequency range, function, food product, and region.